Scottie Mom: Where'd you Go? Why would anyone give up on him?????? I know that one. I was a product of a puppy mill in Guadalajara, Mexico. I really lucked out, just like H&K. Such a sweet boy he's so lucky to have such a Scottie Mom! Breaks my heart he had such an unlucky start in life! Unlucky start, yes, BUT an EXTREMELY lucky life now... and that's what counts!!!! You are so right, ScottieMom-our babies grow really attached once they open their hearts! And introducing new guys to your Scottie male can be quite challenging, Macalister let me know who, in no uncertain terms, he deemed worthy of Mom's attention. Even in walking down the streets when we lived in Chicago, I learned quickly to pay attention to my Scottie's instincts on strangers. Pretty amazing, really. Heather and Mr. K are so lucky to have such great hoomans. I've been. Earning to ask, what does the "K" stand for? I assume they were already named when you adopted them? Poor Mr K. That must be so tough on him. I hope he can learn to fully trust again though it is hard to let go of the past. Pets are not ornaments for display. That said it always amazes me how forgiving dogs are despite the abuse heaped on them ( unfortunate)) they still love their 'owners'. Breaks my heart. Poor Mr K, he's so lucky to have you. What a wonderful story. It really breaks my heart when I notice that the feelings of my two are hurt when they look at me with their eyes and their ears back. They are either playing me or really do have hurt feelings. Dear Scottie Mom, I have been meaning to write, I'm very good friends with the Livingston's, Heather's foster parents, I was hoping to meet Heather on her way to you that weekend but it didnt work out. My husband Doug and I live in a small town near Chattanooga, we have four Scotties Maddie, Marley, Chaplin and Spencer McCloud. They are on John's blog. I love your stories on Heather and Mr. K, I read it everyday. I have to admit, I'm very impressed at how much you truly love them and understand them, you have to be owned by a scot to truly know what I'm talking about, once you open your heart to them, there is no turning back. I actually feel sorry for those that are missing out, they dont know what they are missing. The scots do have a way of wrapping us around thier little paws. They mean everything to me. I have so many stories to tell, that is my favorite thing, talking about my kids as I call them. I will close for now. But wanted to let you know, the scots and I are big fans. I can tell from your comments it is just a matter of time before another scottie will be joining your family, which i think is a wonderful idea. You can never have enough scotties. After you get the second, the third and fourth is easy. @Shelby - So good to hear from you and thank you for your kind words! I've been looking for a reason to unite Heather with her incredible foster family some day so perhaps in the future you'll get to meet her! 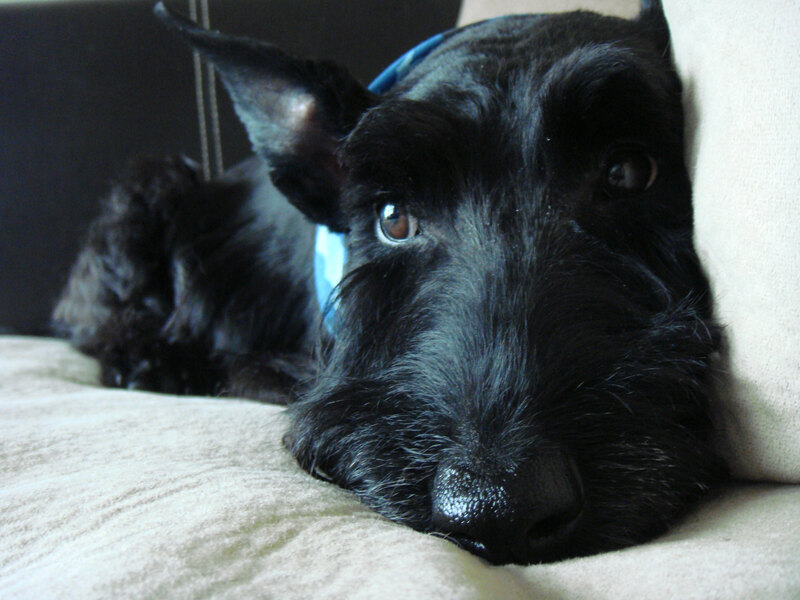 I'm so happy to hear from a Scottie Mom who has four fur kids. I passed along your message to Scottie Dad in hopes of swaying him towards letting me rescue another someday in the future. My goal is to have four (once we've moved into a house big enough for all of us!) as well but I know Scottie Dad isn't keen on that idea. My argument is: if you've got the means and the room to save a life, why not? You're only adding happiness to the lives of all involved! ScottieMom, Your argument was my argument and though he was not happy about it at first, he came around after I got them of course. I know him better than he knows himself, plus I know the Magic of Scotties they are irresistible. Four is just as easy as one. We camp with the Livingstons all the time and the Scots love the Motorhome, I lead all 4 at the same time and they do great on their walks. Its takes a little longer because it is their walk and not mine, so I let them sniff and mark at their leisure. ScottieDad will soon find out that, more is actually merrier.